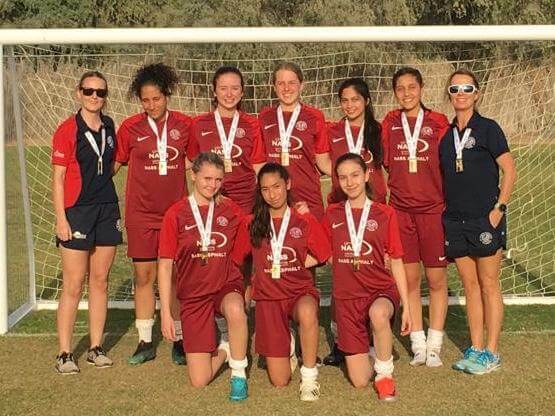 For the first time in many years, The Unity Cup in Dubai ran a 7 a-side girls’ tournament at the end of January. St Christopher’s entered a strong squad of 10 senior girls, unfortunately two girls were too unwell travel with us, (Nadine El Sharkawi and Charlie Axtell) and Kate Searl was unable to play due to ongoing injury. However, their input into training sessions throughout the year was invaluable and benefitted the team travelling. 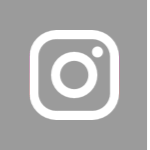 The girls’ tournament, alongside the boys’ tournament, was held at the Rashid School for Boys, where the players were treated to playing on beautiful grass pitches surrounded by trees and in the perfect, although maybe slightly too warm, conditions. 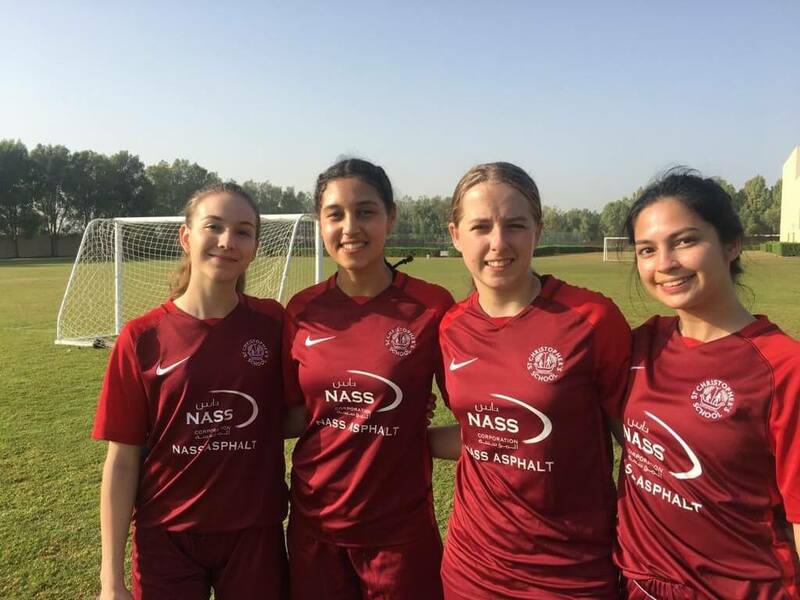 Over the two days, the girls played a total of 10 games against a selection of local UAE schools as well 3 from Saudi Arabia. Throughout the event, the girls could not have shown more commitment, determination and resilience, both as individuals and as a team. 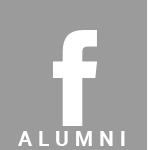 With no subs available to them, when at times it could have been useful, they all played, without complaint, some remarkable football, taking them through to the final against Dhahran School. They unfortunately lost but not after giving 100% into this game, where Dhahran scored the only goal right at the end of extra time.The girls should be exceptionally proud of their performances and went unbeaten until their seventh match. We were in safe hands with Jesse-Leigh, Patricia Hajszan, Charlotte Pilgrim, Dani Wilkinson and Kia Hanahoe all taking turns in goal, only conceding a total of 9 goals over 10 games. Not only were these players solid in goal but they were influential outfield. Up front we saw Dani Wilkinson (Captain) and Kia Hanahoe develop into a skilful attacking duo, proving both are prolific goal scorers. Charlotte Pilgrim, with her precision goal shooting, scored a hat-trick against UAS. Patricia Hajszan was every opposition’s nightmare, as a holding midfielder she closed many scoring opportunities very early up the pitch. Amna Al Matrook displayed some phenomenal skills in defence and confidently attacked from the back line, scoring 2 goals throughout the tournament. Celine Abu Zahra displayed admirable intensity and defending throughout each game, always keeping her cool. Jessie-Leigh was very tactical in the attacking line consistently switching play and making space for players to run onto the ball. Her clinical finish against AISR secured our second win of the day. Kate Searl, assisted in coaching the team, imparting her excellent knowledge of game tactics to her team. Additionally, she led warm ups and and contributed excellent advice during the team talks. 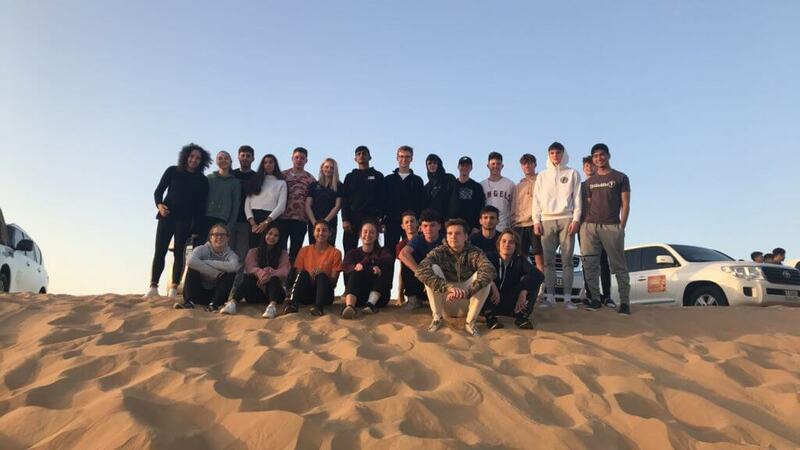 The girls were able to relax on the Friday evening, where they were all treated to a 4 Wheel Desert Safari into the sunset followed by a barbeque, camel riding and other entertainment. 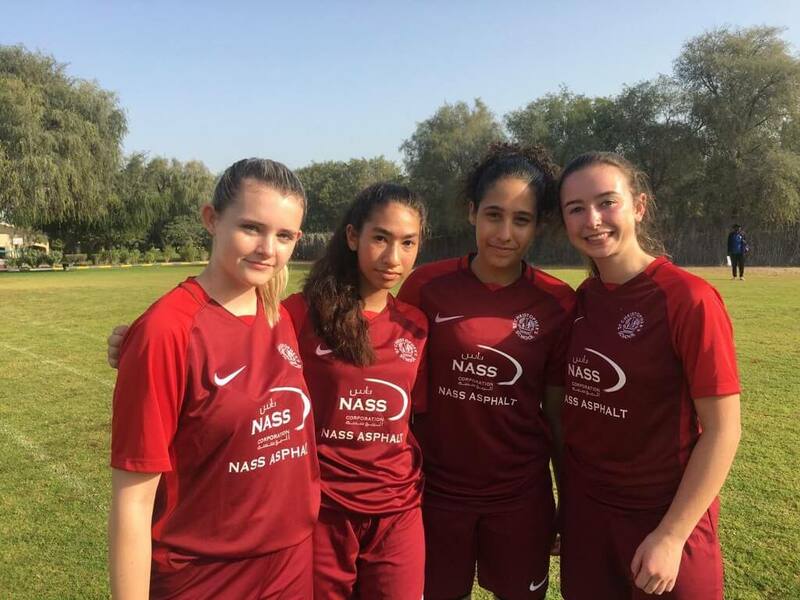 The girls can take huge confidence from this tournament having played fluent attacking football as they prepare themselves for the Bahrain Schools Sports League.